Genetic studies in both humans and model organisms (such as worm, fly, zebrafish, and mouse) are leading to the identification of new and previously unsuspected genes involved in addictive processes. This symposium highlighted the use of model genetic organisms to identify novel genes or gene variants involved in addictive processes. 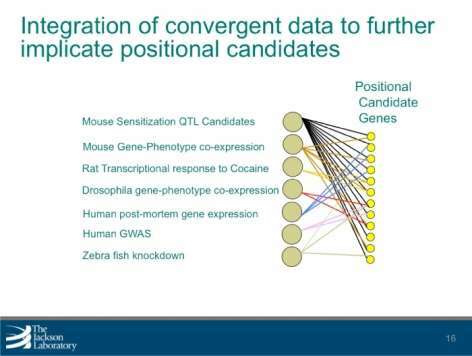 Dr. Chesler described a mouse systems genetics approach to identify genes involved in a suite of substance abuse-relevant behavioral phenotypes. Dr. Heberlein described her work in fruit flies to identify a novel receptor protein kinase pathway involved in cocaine sensitivity. All speakers discussed strategies to translate their findings into new diagnostic or therapeutic tools for substance abuse. Genetic variation determines differences in behavior and brain function. It can also help identify and characterize molecular processes associated with the brain and behavior, or neurobehavioral phenomena. Systems genetics is the practice of simultaneously examining the effect of naturally occurring genetic polymorphisms (differences in DNA sequence among individuals) on networks of molecular and phenotypic processes. Dr. Chesler and her team of researchers used this approach to identify genes and gene networks that alter behaviors associated with drug- and alcohol-related disorders. The research team used mice to identify multiple substance abuse-related behaviors, which resulted in more than 250 observable characteristics or traits (phenotypic values) from 49 tests. These values, which included cocaine response and sensitization, morphine response, and naloxone-precipitated morphine withdrawal, were then combined with existing molecular and genetic data to perform genetic mapping. This resulted in the detection of 25 significant quantitative trait loci, or regions containing one or more genes responsible for variation. An additional 70 regions were identified for the phenotypes investigated and analysis revealed multiple phenotypic factors, which were compared with additional measures of behavior obtained in the same population. By combining the behavioral data with gene expression data from multiple tissues, the research team identified positional candidate genes and molecules associated with changes in behavior. The team is further refining these candidate gene lists by combining related gene-centered data. Researchers can use the polymorphisms, or distinct characteristics that exist in the same species, to identify how behavior relates to underlying molecular processes. By doing so, the discovery of pathways and mechanisms that illustrate the behavioral tendency to abuse drugs can be accelerated. This presentation described a new molecular system in two species that is important for the response to cocaine. Dr. Heberlein and his research team showed that the fruit fly (Drosophila) protein dLMO and the related mouse protein LMO4 control the effects of cocaine on the brain and behavior. Both proteins are involved in modifying the transfer of genetic information from DNA to messenger RNA, thus regulating the expression of genes in the brain. The nucleus accumbens, a brain region implicated in drug addiction in mammals (including humans), is strongly affected by cocaine. The research team found that the activity of LMO4 in the nucleus accumbens is important for behaviors in mice related to long-term exposure to cocaine. They have identified genes that are regulated by dLMO in fruit flies. 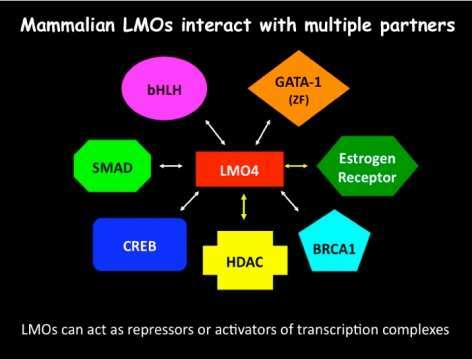 Among these is the gene encoding the receptor tyrosine kinase dALK, whose mammalian homolog, anaplastic lymphoma kinase, has been implicated in many cancers as well as depression-related behaviors. These studies suggest that identifying genes in the brain controlled by dLMO in fruit flies and LMO4 in the mouse will be important for finding new approaches to treat cocaine addiction in humans.